Don’t let stretchy knits intimidate you. Meg McElwee sets you free with easy patterns for the most comfortable clothing you’ll ever make. Follow along as she shows you how to create a fleecy hoodie, T-shirts, shorts and a dress. 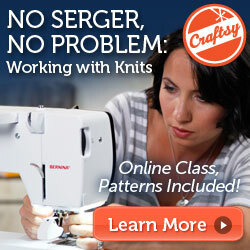 She’ll give you tips for reinforcing seams without a serger and how to customize each garment. As a bonus, you’ll learn how to dye your finished pieces. Enjoy a So Sew Easy readers exclusive 25% discount on this course.